I am sometimes referred to as the "Louisiana Catahoula" because I am the official state dog of Louisiana. You might also see me referred to as the "Catahoula Hog Dog". I hunt almost anything and am really an outdoor type. Some folks claim that I have red wolf in my blood, but I'm not sure about that. I am loyal to my owner once we have established the rules and determined who is going to be in charge. Left to my own devices, I will vote for ME to be in charge of the household, so it is up to you to set the limits early on if you don't want that to happen! When fully grown, I am between 20 and 26 inches tall (50.8 to 66 centimeters). We have no Catahoula Leopard Dog Breeders listed at this time. 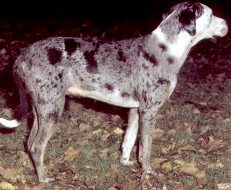 Click here to place your Catahoula Leopard Dog Ad!